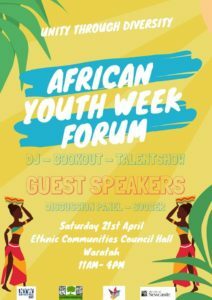 Join us this youth week as we celebrate our African Heritage through local youths! ▪And many more to be announced! An epic weekend celebrating an epic continent! For further inquires or if you’d like to showcase your talent on the day, feel free to send a message and one of our organisers will be in contact. Don’t forget to rep your country! Bring along your flags, traditional attires and accessories.